Totally agree with this one! You’re very welcome, Nonoy! Keep drawing and writing a great story! Very impressive drawing, and the story to accompany it was inspired. Nice job! William thank you so much. Aina thank you for your kind words. Aina thank you with a smile. You think to deep! actually I don’t know how you people put that icon smiley at the end of the comments. that’s why I write the word with smile. Noy, u don’t know what I went through here. Check ur inbox! The smiley only shows if ur Mac user. I took out that posting and conceded to you already. You shouldn’t removed The post. It’s a healthy discussion. I follow some blogs we have these Grilling informal debate but at the end of the day they are still my friends. Aina believe me you the only real relationship that last is friendship. I know how to concede, Noy. Another beautiful story with amazing illustration Mark! Awesome, mate! Loved the illustration, and the text pulled me right into the world you created in it. well done! wow, this illustration is very impressive with its perspective. Interesting writing too! Madam Mimo your comment is very much appreciated. Thank you. you are the master of the dramatic! I’m glad you like it. Your comment is very much appreciated. Thanks again. Wow, another fantastic drawing and story, you are so talented!! Thankyou so much for sharing. Your comment means a lot me thank you. David thank you for the warm comment. Madame I hope your your problems with wordpress bugs will disappear immediately. I don’t want it to affect you to much.thank you for the warm comment. I love the angle and perspective on this artwork. Artwork and story I give an “All Thumbs Up”…(-: Also thanks for your comments on my blog, I appreciate you! Sherry k. I glad you like it thank you so much. Great work on that staircase, Nonoy. Kristin thank you so much. What a gripping tale (and image) Nonoymanga! Excellent story and art work. 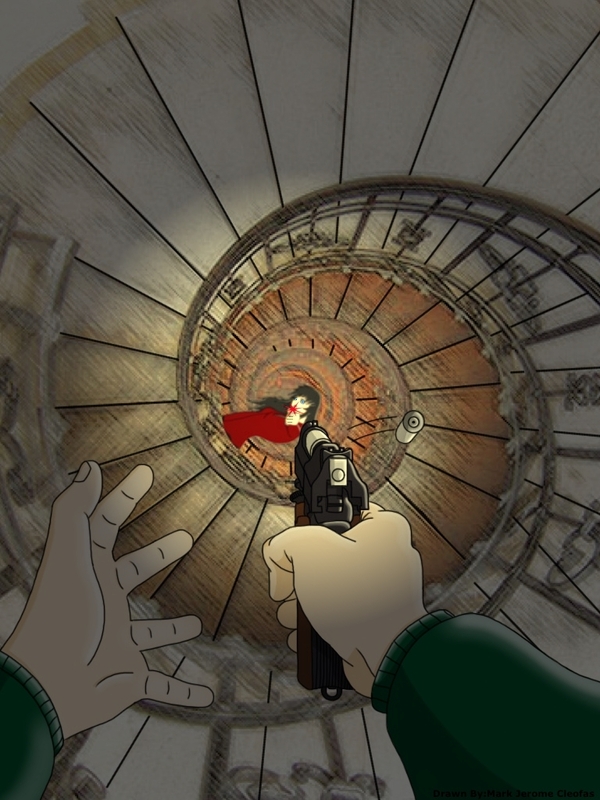 I got dragged into the story, like gravity pulling Diana down the staircase! More please!! I love your art and the story! Hero’s don’t run! That story was really powerful. And your drawing is really cool! i’m glad you enjoy it. thank you. I pinned this on my visual arts Pinterest board with your blog address. Madame Jenny i’m glad you drop bye thank you. Very nice. There’s a lot of possibilities ahead for you. Are these drawings scanned or drawn with a tablet? Every time I see a spiral now I think of Uzumaki. Great movie/manga if you haven’t seen/read it. Cro I want to check that anime “uzumaki”. For these one it’s combination of both. Thanks for the warm comment. Is there an animated version of it? I’m talking about the movie. It’s bizarre, very good as long as you don’t watch it as a straight horror film. The director made another movie adopted from the same guy who wrote Uzumaki. It’s called Long Dream and it’s impossible to find. I have Uzumaki in .cbr, somewhere. Cro man your referring to spiral obsession I read the manga version only. One he’ll of serious horror very similar to the classic horrors in the 70’s silent and serious. Very few do that type of horror movies or anime. It will stay in your thought for a couple of days. Just to let you know that I have passed along the Kreativ Blogger award to you. You are so very talented. Claire i don’t know how thank you. your words are very encouraging. Loved the Twist in the end. You are an amazing story teller. Wow, you’re kind of a big deal! 🙂 Thanks so much! love that pic ❤ is it your hand drawing edited in your computer? Sedge thank you to your very encouraging comment.